Undated photo of Eliza & David JACKSON March 6, 1899. 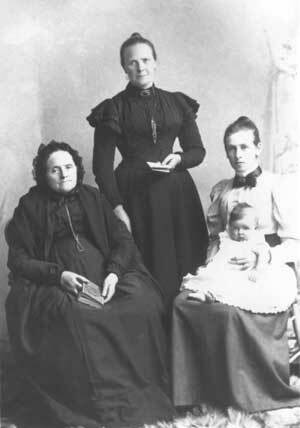 Left to right, Eliza (OLIVER) JACKSON, her daughter, Sarah (JACKSON) GILMORE, her granddaughter Mary Jane (GILMORE) BARTLEY and her great-granddaughter Eileen Oliver BARTLEY who went on to become a medical doctor and who was responsible for much of the documentation upon which this history rests. * The records which indicate“Benjamin OLIVER” to be the father of Eliza OLIVER originate from Gita JACKSON’s records and from Blin BROWN's. An excerpt from “Peerage and Baronetage” p. 1434 denotes Eliza’s father to be “William OLIVER, of Killynure”. According to “At the Ford of the Birches”, William and Benjamin were both brothers. Until further evidence, I'm sticking with "Benjamin" as the most likely. Interestingly, the “Peerage” records also show the son, James JACKSON, marrying at age 16, (his wife, Elizabeth Sarah BROWNE). If verified, this is interesting! John JACKSON married Kate WHITING, had children and then predeceased his parents (at age 47). Thomas JACKSON, of the Hong Kong Shanghai Bank married Amelia DARE and was knighted. Elizabeth JACKSON married Thompson BROWN and went on to have ten children. Mary JACKSON married William MENARY, and then later Fred GRIFFIN. Andrew Coulter Bradford JACKSON married Eliza GILMORE, his half-second cousin once removed. James JACKSON married Elizabeth Sarah BROWNE at age 16. Margaret JACKSON married Dr. Robert Hamilton REED, and then Andrew Bradford MCCULLAGH. David JACKSON married Margaret WRIGHT, worked for HSBC and died at Yokohama. George, who was the baby of the family, died at age fifteen months in 1859. NOTE: The photo at the head of this page is from Mim MOORHEAD’s collection. It comes from her mother-in-law, Jeannie MOORHEAD (née JACKSON). .
Two letters, from Mim MOORHEAD’s collection shed a little more light on the lives of David & Eliza. The first letter is written from Urker on March 20, 1889 and starts with Eliza scolding her son, Andy and his wife Emily (to whom the letter is addressed) for not writing. The first news is that Tom (I assume Sir Thomas) has arrived safely at San Francisco, will stay there an unknown length of time and then be met by “Minnie” - likely their daughter, Beatrice. At the time of the letter, Eliza’s family is in the midst of whitewashing and papering as part of preparing for the hoped for visit. Eliezer (GILMORE - the brother of Emily née GILMORE) is mentioned twice. He had married Sarah JACKSON, the sister of Andrew, and it seems from a subsequent letter that he is managing the family farm at Urker. This would make sense as both Eliza and David would be in their mid-seventies by now. After a bit of shopping news, there is mention of the death of Mary DONALDSON, presumably a family friend - possibly connected to the DONALDSON who married Elizabeth JACKSON (daughter of John JACKSON and Elizabeth McCULLAGH). The other bits of interest concern Eliza’s support for the temperance pledge and her hope that Andy (presumably her son) would take the pledge. There is a mention in "Full Circle" p. 271 of a Thomas GILMOUR signing the temperance pledge in 1872 & a copy of said document – though I have no idea of who he might be. One might guess that Eliza’s son Andrew was an enthusiastic imbiber or that Eliza was decidedly straight-laced. The next letter is harder to read than the first and has many words that I have yet to decode. It also involves legal intricacies, which at present are beyond my ken. Most of this letter has to do with a judicial lease held by Sam BRADFORD for Cavananore. BRADFORD had received the property from “James GILLMER and the other worthies”. It seems the lease was from Majors McCULLAGH and GILLMER and had a proviso that it not be subleased. I have no idea how many generations this arrangement may have gone back, but two generations before Eliza, there was a Mary JACKSON who married a J. GILLMER (GILMORE). As of yet, I have no records of whether they had children. There are also BRADFORDs in the family tree at the same time, so although I suspect a connection, I don’t have it nailed down at this time. "Cavananore”, a towenland of 219 Irish acres situated near Dundalk had several houses on it and as a consequence of the legal action, the Bailiff came and evicted Mrs. MCCOY and an old woman, but then allowed the MCCOYs to go in again as caretakers for a penny a week. Sam BRADFORD was allowed a certain time to remove his cattle, but also had to pay a year’s rent to the Trustees. It seems that the infraction, which triggered the court action, had to do with the use of the land. It had been ploughed and rendered unusable for grazing. Sam BRADFORD swore that the land had been in good condition when he got it but that unbeknownst to him, his stewards had cut the hedges. To add to the family’s bad news, one of their help, Peter, was tried in Armagh for stealing a calf at the November fair. He was convicted and sentenced to four months imprisonment and hard labour. Eliezer subsequently “hired another boy” to take his place. The only other references of interest concern the children’s schooling with a Miss PARKS (the previous letter noted a cheque for 12 pounds 5 to pay the governess). Jeannie MOORHEAD would have been 14 at the time and her youngest sister, Elizabeth, would have only been one year old. There were three brothers between them, so who knows who the “scholars” referred to in the letter might be. Information from other letters in the MCCULLAGH collection will be added at a later date. The times which David and Eliza lived through must have been unsettling to say the least. The population of Armagh decreased between a third and a half. While thousands of the more vulnerable people died as a result of the potato famine, thousands more emigrated in search of a better future. This reality could very well have been the impetus which led their two sons, Thomas and David to choose careers in the Far East with the HSBC. 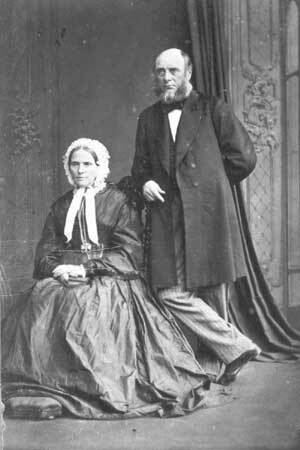 Their grandson, Francis Gordon JACKSON (son of their oldest son, John) emigrated to South Africa and another grandson, Thomas Jackson BROWN, son of their daughter Elizabeth, emigrated to Canada. Most moved away from the family farms at Urker and elsewhere. LDS info (film 0183543) gives Eliza’s birth as about 1815 at Killynure. It also mentions a relative Charles JACKSON. The mystery of who this Charles JACKSON is has yet to be unravelled. According to information from Amanda KNOX (the current owner of Killynure with her husband, Edgar) the OLIVERs are buried on Tommy O'HAGAN's family’s land. Cows graze there now in a small enclosed field on a hill. The headstones are flat on the ground, but all writing has long since been obliterated.